Walk into the baking or cereal section of just about any grocery store in Southern Oregon, including Food 4 Less, Albertsons, Costco or the Ashland Food Co-op, and you’ll find neat little packages of hemp hearts, the tasty inner portions of hemp seeds. Sold largely as a breakfast cereal or smoothie ingredient, hemp hearts make a tasty addition to many baked goods, including muffins, cookies and pie crusts. The first thing to know is that hemp hearts won’t get you high, because they don’t contain THC. But what they do contain is nutrition. According to the Agricultural Research Service of the United States Department of Agriculture, shelled hemp hearts are nearly one-third protein, which is an extremely high ratio for any food, not just plants. They contain all of the essential amino acids, which are the ones you need to get from your diet because the human body doesn’t produce them. And they are rich in essential fatty acids, the types of oils needed for optimal health. In addition, hemp seeds deliver significant amounts of calcium, iron, magnesium, phosphorous, zinc and manganese, with traces of several B vitamins. Hemp hearts look and feel a bit like wheat germ or oat bran, with a similar consistency. Added to baked goods, hemp hearts make their presence known with a nutty flavor some people describe as a cross between sunflower seeds and pine nuts. If you decide to experiment with them, start by adding about a quarter cup to a cup or two of flour. The pie recipe below, for instance, originally called for 1-1/2 cups of flour in the crust, which I altered by adding 1/4 cup of hemp hearts and reducing the flour amount to 1-1/4 cups. Because it’s a press-in crust, you don’t have to roll anything out. Just put all of the ingredients into your pie plate, mix them well and use your fingers to press it into place. The berry portion of the pie utilizes fresh or frozen berries held in place by a blackberry glaze, so the pie delivers a fresh taste that transports your taste buds straight to the sunny morning your berries were picked. In a pie pan, mix the flour, hemp hearts, 1-1/2 teaspoons of sugar and the salt. In a separate bowl mix the oil and soymilk. Pour the wet mixture over the dry, and mix it together with a fork. Then use your fingers to press the crust evenly into the pan and up the sides until it is even with the edge of the pie plate. Bake the crust at 400 degrees for 10 minutes or until it just starts to brown. Set aside to cool. Cook the berry mixture over medium heat, stirring constantly. When the mixture begins to boil, continue cooking for about a minute. The mixture should look thick, shiny and almost translucent. 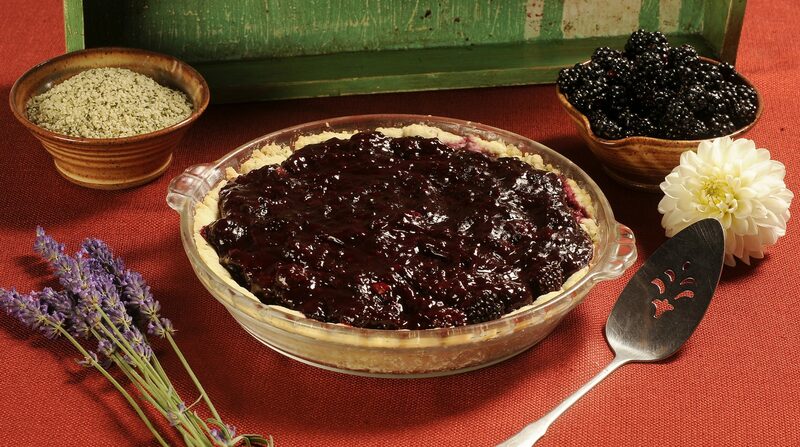 Pour 3 to 4 cups of the fresh or frozen blackberries into the cooled pie crust, then pour the hot glaze from the saucepan over the berries. Put the pie in the refrigerator long enough to let the glaze stand up, about an hour. The combination of the raw berries and the glaze makes this an extremely flavorful and fresh-tasting pie. Reach Southern Oregon Good Herb editor Dave Smigelski at 541-776-8784 or dsmigelski@rosebudmedia.com.